Britain has three native species of woodpecker, all of which use their strong bills to excavate a hole in a tree for nesting. 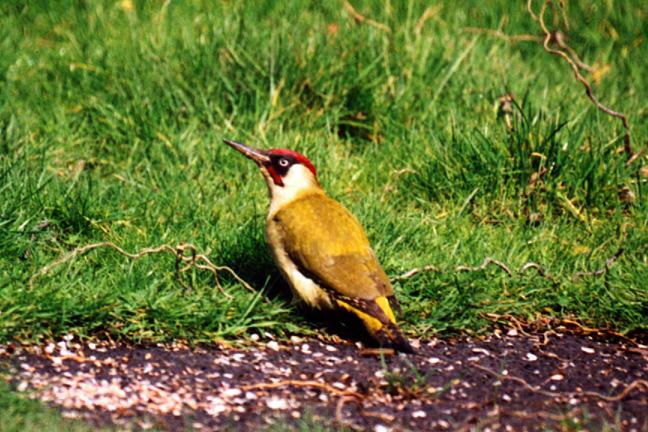 The green woodpecker is the largest and is less of a strictly woodland species than the others. It is often heard giving its laughing call that earns it its country name of 'yaffle'. It spends much of its time on the ground searching for its favourite food, ants. The other two are both mainly black and white in colour with patches of red, and communicate by drumming on a tree with their bills. The lesser spotted woodpecker is only about the size of a sparrow and its drumming call is shorter and higher pitched than that of the great spotted woodpecker, which is about the size of a song thrush.